In the summer of 2012, if you had not seen the ad with the cat dancing and singing “fishbone, nanana nanana, meow meow”, you obviously had not been watching local television or attending the cinema in Jamaica. 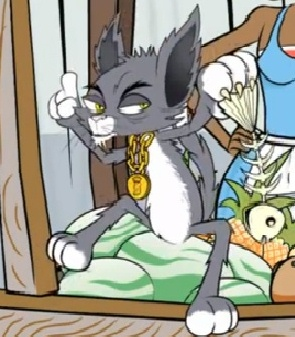 The cat, which has been affectionately called “Fishbone” by fans, appeared in the Broadcasting Commission of Jamaica‘s latest animated television ad dubbed “Handcart Wisdom”. The ad was first aired on national television stations on June 28, 2012 and was being shown in prime time slots on Jamaican television stations. The animation for this 30-second ad was done by Anieph and Alison Latchman, the husband and wife team of Alcyone Animation, along with illustrator Marlo Scott, who are also creators of the Cabbie Chronicles cartoon series. The BCJ, Jamaica’s media regulatory body, has used public service announcements (PSAs) to promote issues of media regulation affecting Jamaican audiences. For example, in the past, they have promoted the use of lyrics fit for airplay on radio stations in their “Studio Mix” PSA. They also promoted the use of remote control codes to block children from viewing adult content in their “Put in the Code” PSA. These former ads depicted scenes using drama with various characters promoting the messages. The ads ended with a voice-over announcing the tagline: “More choices, better access and higher quality”. In the most recent cartoon ad, the tagline has changed to “People transitioning digital” – an appropriate slogan given the digital transition that is underway. One of the main objectives of the “fishbone” cartoon ad was to focus wide attention on its message utilizing a fresh, cutting edge, creative and out-of-the-box approach to providing public information. Why did the ad work? The success of an ad rests in its ability not only to hold our attention but also to deliver the message in such a way that we perceive the meaning in the way it is intended as well as remember the message long after we have seen or heard it. This is not easy. Three challenges to effective communication help to explain why. The challenge of selective attention assumes that audiences choose to pay attention to some information and ignore others depending on how much they agree with the content of the message. Selective perception suggests that people interpret information on the basis of their experience. Selective retention proposes that audiences decide to remember some information while largely forgetting much of what they initially observed. the use of edutainment which includes a dramatic scene depicting a Jamaican market place with its predictable characters – the buxom market woman, the handcart man – expressing themselves in our native language; characters many of us recognize, especially those of us who actually shop at the market. And if that wasn’t enough, there is also a dancing, singing cat which acts as a surprise element at the end of the ad, giving us something to take away and talk about. With all these entertaining elements which made most of us wanting to keep watching the ad over and over, did people actually get the message? Some critics argued that the ad may have been somewhat ineffective because many people seemed to only remember the cat singing about its fishbone and forget what the ad was really trying to convey. In a brief online survey done by CARIMAC (Caribbean Institute of Media and Communication, The University of the West Indies, Mona Campus) in August 2012, just over 80 respondents volunteered to offer their interpretation of the ad. From the responses logged, all but four persons liked the ad. Regarding the interpretation of the main message, most responses ranged from basic explanations such as “we should monitor music” to more in-depth elaborations – “we should listen to radio stations because we are more likely to hear songs with clean lyrics given that the BCJ regulates radio stations.” After seeing the ad several times, I think the BCJ was also encouraging media consumers not to just monitor music, but also monitor music played in public settings, especially spaces where you are likely to have children present. Regardless of your particular interpretation of the ad after having seen it, Jamaican audiences definitely noticed it and took time to discuss it with their friends at public gatherings as well as online, including the BCJ’s Facebook page. If the BCJ wanted to hook your attention, so you could think about the issue of monitoring music played in public spaces, this ad was a great bait. But more questions are left to be answered. Is this ad a turning point for the BCJ’s approach to promoting media regulation issues? Given BCJ’s image as a media monitor whose handling of some regulatory matters in the past has not been well-received by all, do people see the organization in a different light now because of this ad? Mind you, a different kettle of fish, but nevertheless something worth pondering. With the appeal of Fishbone, the BCJ may benefit from employing it for future ads. Many of us [Jamaicans] view foreign cable channels and we have seen animals playing a major role in some ads – the Aflac duck, the GEICO lizard; I guess in Jamaica we could have the BCJ cat. Ultimately, the long term impact of the BCJ’s campaigns will be determined by the extent of audiences’s level of recall and comprehension of the messages and their willingness to act on the behaviours suggested by these messages. Even though we are operating in a limited-resource environment, for effective behaviour change to occur, we would need more than a single PSA; additional communication strategies must be incorporated if campaigns are expected to facilitate long term change. The “Handcart Wisdom” ad has been disseminated on many platforms including traditional broadcast media as well as online social media. In this animated ad, the BCJ persuades us to implement the behaviour of monitoring music on the public airwaves. If we were really that in love with Fishbone, maybe it’s time we all dance to a different tune, challenging ourselves to be better media monitors. Very good article and the issues raised are spot-on. “Fish Bone” aka BCJ Cat will feature in future campaigns. Based on audience response, he will be around for a while. We are looking forward to the future BCJ campaigns, Cordel Green.